In the back up greenhouses at the Atlanta Botanical Garden is a bumper crop of seedling Embreea orchids that have just reached flowering size. They are making their debut this month in the Orchid Display House. Embreeas are considered to be rare and difficult in cultivation, so we are delighted to be able to show them to you. 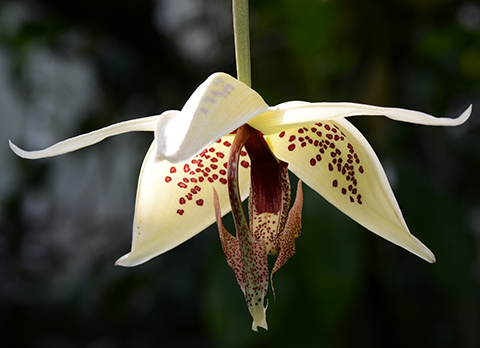 Embreea is a striking orchid that resembles the closely related genus Stanhopea. It shares with Stanhopea the pollination syndrome associated with male Euglossine bees,--large tropical bees that collect fragrance. The waxy flowers are huge (about four inches) and their eucalyptus-like fragrance is highly attractive to Euglossines. The flower points downward and the column and lip together form a chute to guide the bee past the pollen masses located at the tip of the column. Embreea produces a single-flowered spike, rather than the massive multiple flowered spike of Stanhopea. The horns on the lip have a very distinctive hatchet shape. Since Embreea rodigasiana comes from an especially wet area of western Colombia--the Choco region--we water our plants more frequently than we do our stanhopeas. Embreeas absolutely need a humid greenhouse in order to flourish outside of the warm tropics. Our plants do well in a mixture of New Zealand sphagnum and chopped tree fern fiber. A wire or net basket is needed in order to accommodate the pendant spike which often grows downward through the medium. Don't miss these! You can find them in the Orchid Display House this month in baskets hanging below the beams of the cedar pergola.